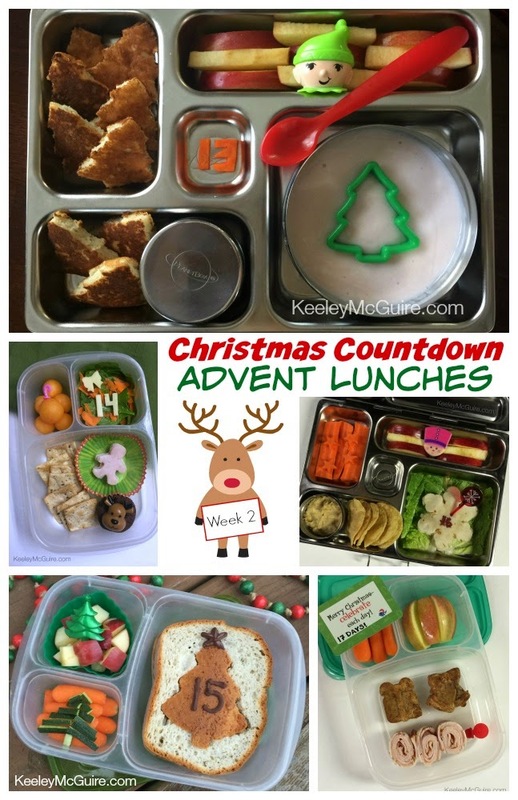 Welcome to Week 2 of our Advent Lunches, Christmas Countdown, Round-up! Monday meant just 17 days left until Christmas. We had been experimenting with a new grain-free & top 8 free recipe on Sunday, so we packed two of the muffin bites on Monday for lunch. 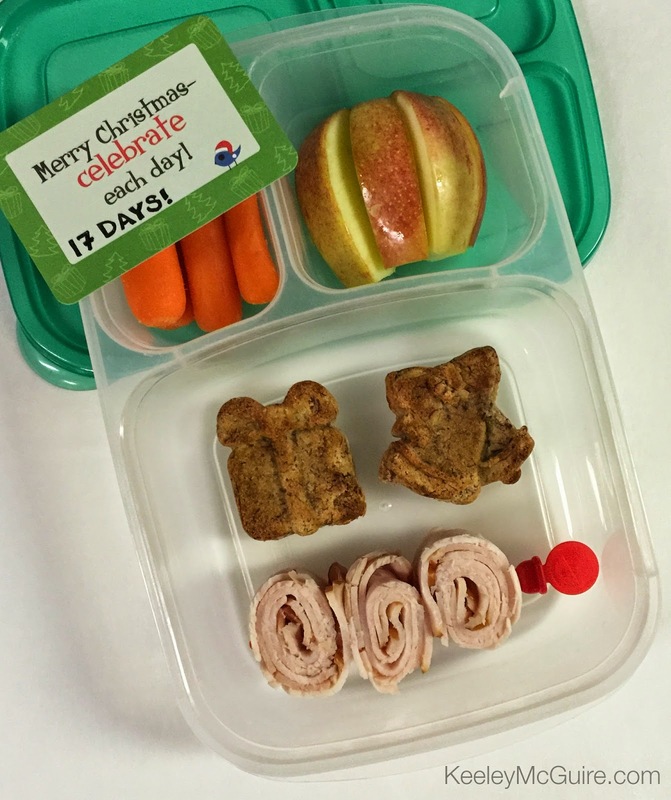 Besides the holiday theme muffin bites, she also had turkey roll-ups, apple slices, carrots, and a holiday Lunchbox Love Note in an EasyLunchboxes container. Tuesday, we took leftover chicken breast and put them into a quesadilla using Udi's gluten/nut/dairy/soy free tortillas cut into snowflake shape. She also had packed carrots and apples again, as well as, a few tortilla chips and homemade hummus for dipping. Lunch was packed in a Planetbox. Little Miss learned how to make her own hummus at Camp Blue Spruce (an allergy-free kids camp)! She's always so proud to share to make and share it. Wednesday's lunch was my favorite from this week. I made her a SunButter & honey sandwich on Udi's gluten/nut/soy/dairy free bread. 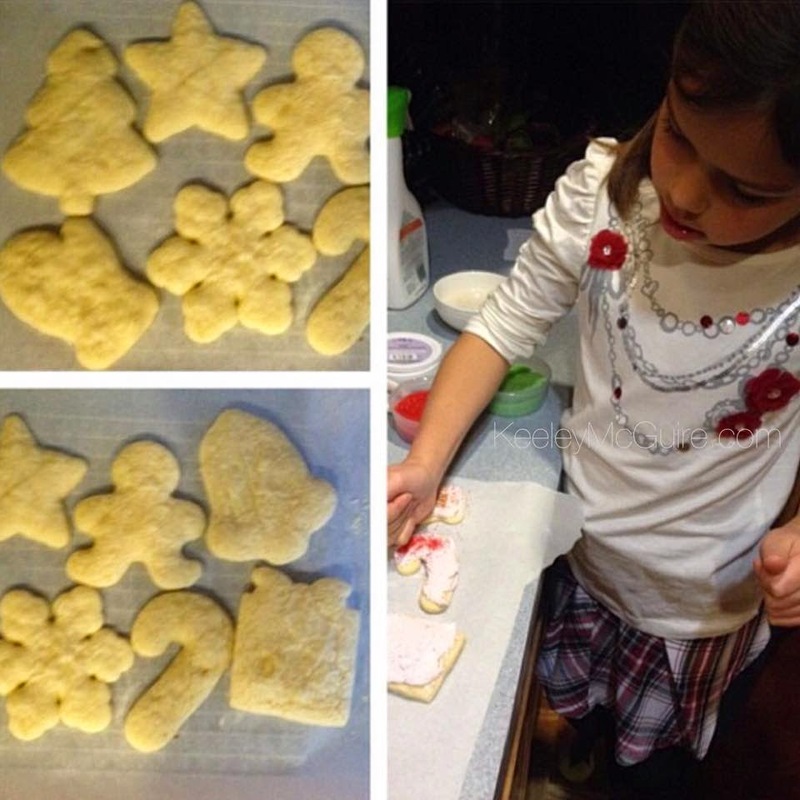 I piped the countdown number and a star on her tree cutout with melted Enjoy Life Foods top 8 free chocolate chips. She also had baby carrots, zucchini tree, and apple dices in an EasyLunchboxes container. 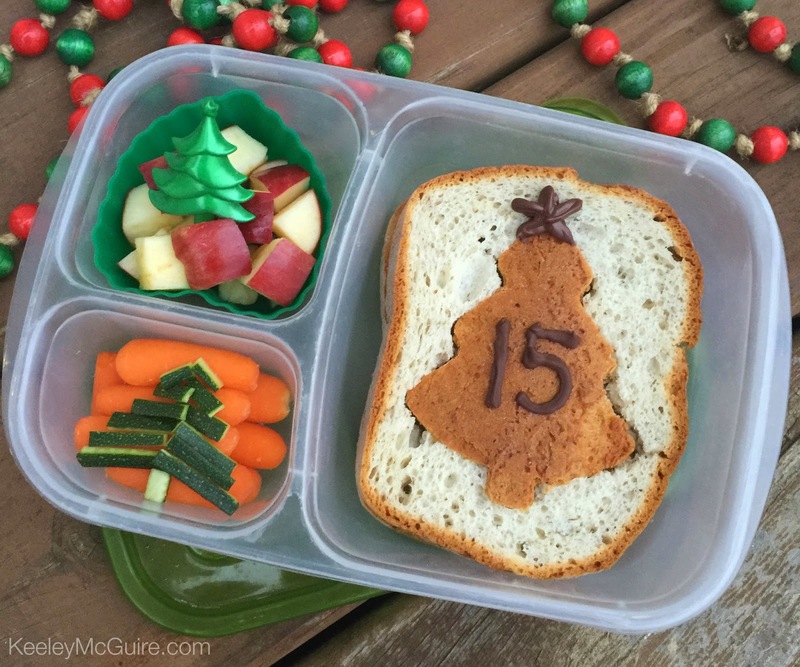 Little Miss helped pack her lunch on Thursday. 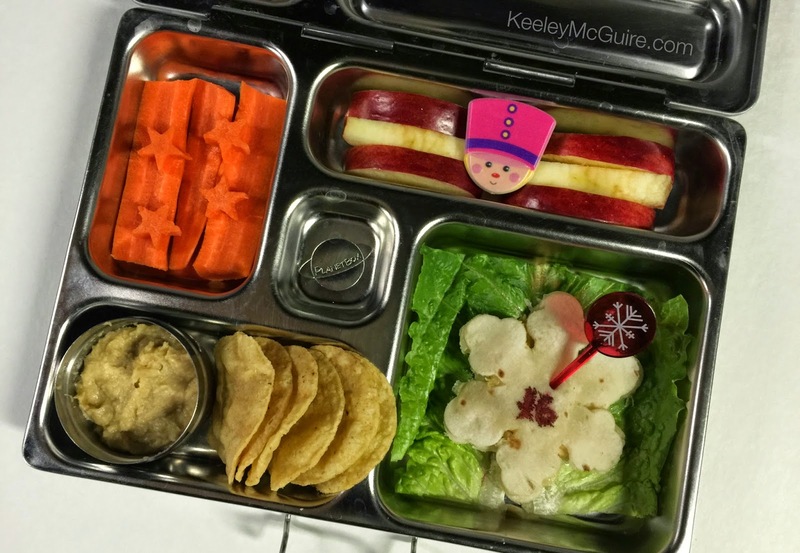 She wanted a DIY Lunchable. We packed up Van's Perfect 10 Gluten Free Crackers (which are also made in a nut free facility). 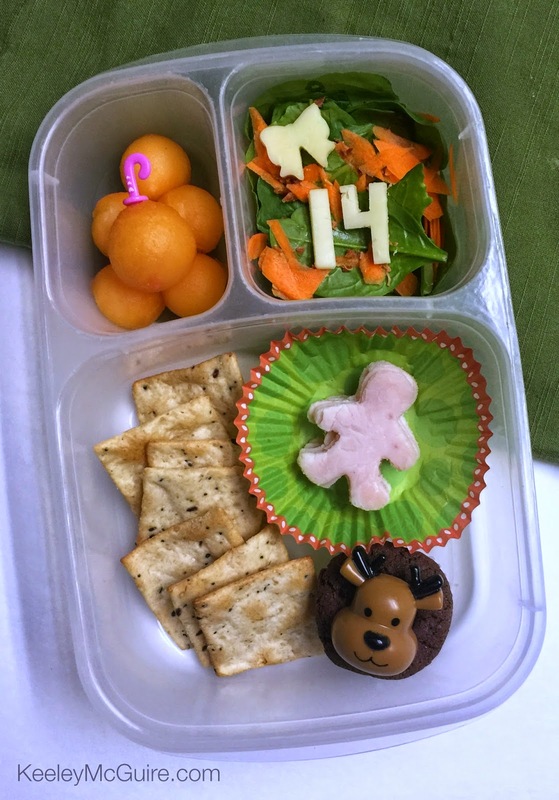 She has turkey gingerbread men cutouts, an Udi's Dark Chocolate Brownie Bite (it's gluten/nut/soy free), cantaloupe balls - including one made to be an ornament, and a spinach side salad. Breakfast for Lunch is one of Little Miss' all time favorite things! 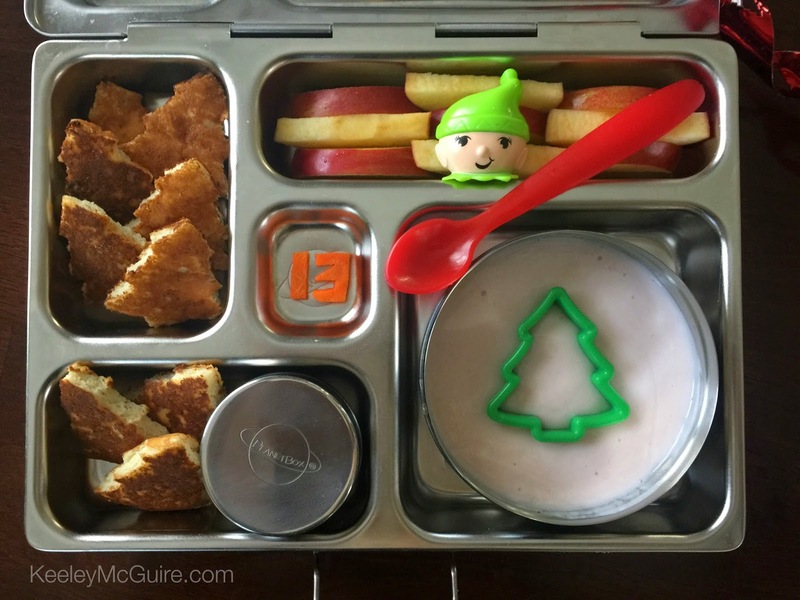 So for Friday, she has Christmas tree pancake bites, syrup for dipping, strawberry organic yogurt, and apple dices in a Planetbox. Friday means only 13 days left until Christmas. EEK! I can't believe how QUICK time has flown by this year. WOWEE!